Nestled in one of the fastest-growing cities in the nation and rich with resort amenities and soaring views, Vintage Oaks offers the most in-demand Texas Hill Country land and homes.  Vintage Oaks is a 3,900-acre masterplanned community in the heart of New Braunfels offering an array of Texas Hill Country land and homes. New Hill Country homes, quiet, private, spacious land with 1–14 acre homesites, and the most amenities in the Hill Country make Vintage Oaks the easy choice for those who are building their dream home or looking to relocate or retire in the fastest growing community in San Antonio area for over four years. The community’s celebrated amenity package comprises several pools, a lazy river, children’s playgrounds, ball fields and sport courts, miles of meandering trails, a Tuscan Clubhouse, home to year-round activities and special events and new 7,800 sq.ft. Fitness Club with a lap pool, outdoor fitness area, cardio rooms, and more. Vintage Oaks’ insired location right on the Texas Wine Trail and surrounded by awe-inspiring Hill Country topography gives it a quiet, serene, country feel. Yet, the community’s ease of proximity offers unique access to both San Antonio and Austin, both of which are within easy reach for commuters considering Texas Hill Country land and homes. New Braunfels’ bustling economy provides ever-growing employment opportunities to go with its charming shops, ample events, and world-class dining. View our featured Texas Hill Country land and homes to learn more about living at Vintage Oaks. From the tuscan-style clubhouse with olympic-size pool, lazy river and fitness facility to the year 'round community events, Vintage Oaks provides the perfect backdrop to a life well-lived in the Texas Hill Country. Follow Us on Instagram @VintageOaksTX! Share your images at #VintageOaksTX for a chance to be featured!.